Hi everyone, how was your weekend? I bet many of you had a wonderful time on Halloween. It all started on Friday, I had a Halloween parade to attend at my kid's school, after the parade, I went to three different class parties for each one of my children. Around 3 o`clock, there was a company Halloween party at my husband`s work. Then, there was a church party to go to. It was a great day, well, especially for the kids. I have five links that I am going to spotlight for this week. There is always something new to learn every week. Have you ever heard of "Paintable textured wall paper"? Suzy's Artsy Craftsy Sitcom used this paintable wall paper and did wonders to her stairwell wall. Isn't it pretty? Simply Step Back used a men's Sweater to make a cute tunic top for herself! I think the new sweater fits her well and is very pretty. Jcrew inspired floral ruffle top was linked by Welcome to the Good Life. There are many t-shirt repurposings out there, and I think this is one of my favorites! I want this top for myself! Check out this well put together tutorial for a flirty flower pin by Twelve Crafts Till Christmas. I bet many of you are starting to thinking about Christmas presents for your friends and family (yes I am one of them). I think it is so cute by it self or as a part of the wrpping of a gift for Christmas. Creating Comfort shared some amazing furniture redos. She has an eye for transforming something plain into something beautiful...Great job! Usually, I do five spotlights... but I had to share this one for Halloween next year. 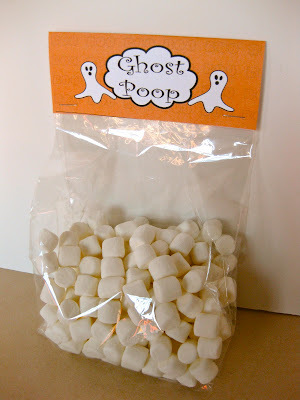 I was going through the links, and the title, "Ghost Poop", caught my eye... "What is that?" I thought. So I went to Can`t Stop Making Things. Isn't it so fun and clever?! Thank you all for sharing your awesomeness (is that even a word?). Have a great start of the week everyone! I have been in a cooking mood lately. I have tried some new recipes, and also I have been experimenting with the pressure cooker. It is fun. Several days ago, I made this butternut squash soup. I have been wanting to make a "fall soup", and when I was at the grocery store, I bought a butternut squash impulsively. Without knowing exactly what am I going to do with it. I googled "Butternut Squash Soup" and read many recipes and reviews (well, I didn't want to waste the squash...). I found a recipe here. It sounded easy and tasty, also, it got so many positive reviews. I had to try it. Mmmm... It turned out good. It was so yummy. I tweaked the recipe a little, instead of cutting it small and boil it, I cut the squash in half and baked it. Also, I used sour cream instead of cream cheese, because I didn't have any. The soup was very thick. I think I am going to make it slightly runnier next time, but I loved the taste. It is getting cold, what have you been cooking in your kitchen lately? I have been working on a couple of jewelries lately, but I haven’t gotten around to taking pictures of them. I promise; it’s coming soon! Meanwhile, I am going to share some of the pictures from out family trip from a couple weeks ago. Bryce Canyon… It was so pretty. I have seen it before, but it was still breath taking. Pretty acorns… looking at them and the gigantic rocks & squirrels made me think of the movie “Ice Age” (have you seen that movie? It is one of our family’s favorites and very funny too). The trees were so pretty I had to ask my husband to stop the car so I can take the picture. This is from one of tne of the viewpoints. The air was so clear and crisp we all enjoyed getting out and exploring a little. Well, we still stayed in the safety range. :) (I was thinking about the TV show “Man vs Wild”… would I be able to survive if I were stuck out here all by myself?…The answer: “No”. On the way home, I saw this beautiful sky with clouds. On day 1, we went to the Goblin Valley. I took many great pictures. The next morning, I accidently erased them all! I was so disappointed that it took me a while to recover from that. (until I was stuffed from the breakfast). I have been spending a lot of time with my family, and with all the activity going on right now I'm just real busy, but I want to get back into creating more soon. Fabric stash, yarn, beads and all the other stuff is calling out to me! Ok, I know you have something under your sleeve, don’t be shy and share with us! For this week's link love...I had a hard time choosing the top five among so many great ideas and tutorials. Although I couldn't leave comments on most of the links (Sorry! But Michael's birthday party is a success and it is over :) ) I appreciate all of your links! The first one... take a look at this cutely shaped pouch! I love her fabric choice, and it looks so cute & useful. Innocentia shared a great tutorial on her blog. 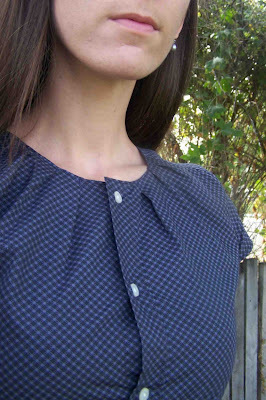 Leafy Treetop Spot shared Men's shirt to women's dress tutorial. What she did was pretty amazing and the end result is very nice. I love this crocheted pouch. Chez Mukweto used puff stitch and created this makeup/coin pouch. She lined it with fabric, so you do not need to worry about stretching the crocheted part. So stylish and fun! The last one... When I clicked on her link, I just said "wow...". 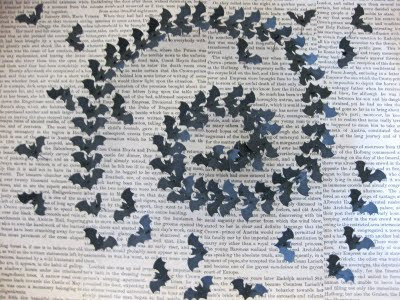 Can't Stop Making Things created this very artful "twisted bats" which was inspired by Paul Villinski. I would love to have this on my wall, great job! It is already the last week of October (can you believe it?! ), are you all ready for Halloween, Thanksgiving and Christmas? Me? I am not, but let's enjoy the seasons as they come and go. :) I will see you at the next post! Michael had a birthday. We are going to have his big birthday party with his friends this weekend, but I wanted to do something small as a family on his birthday... at his request, I made rice krispy treats and we had hand rolled sushi for dinner, which is everyones favorite. How did he get so big, so fast? We are busy everyday and the weeks go by so quickly. There are many things I want to teach him. I try to tell and show him how much I love him as much I can in a day. I make sure his needs are met. But you know what? A part of me always feels like I fall short. I feel like there is so much more I could do. Do you ever think that way? I enjoy watching them grow. I celebrate their birthdays with joy and with a little sentiment. Am I a good mother? Are they happy? I hope they will grow up to be nice decent people. I hope they will have lots of happy memories to take with them when they leave home. Mommyhood if not easy, but definately rewarding. I was watching Michael stuffing his mouth with rice krispy treats and he looked like a chipmunk... That made me laugh, simple things happen in our everyday life, it keeps me a grounded person, and makes me happy. Happy birth day Michael, thank you for choosing me as your mommy. Ok, everyone, my sewing project for today was to sew all the badges to the boys' scouts uniform and hem their scout pants. I don't think I need to post those pictures on here. Although, I would loove to see your creations! Hi all! My family and I have been out of town for the weekend to do a small family trip. The kids were out of school for fall break and we thought that it would be a perfect opportunity to take them to see southern Utah, Bryce Canyon, Zion National park and Goblin Valley. I tried to update my post, but I forgot to charge my camera, and the first hotel we stayed at had a horrible internet connection. Ough! Thank you for linking up to my party again, I enjoyed going through the list. I love this shawl The Student Knitter created. Isn't it so beautiful? The gray she chose and the knitting design give this shawl a light and airy look. Very pretty! Leafy Treetop Spot made this really pretty skirt for the fall. I love the fullness of it, the skirt looks lovely on her. You have to check this out! 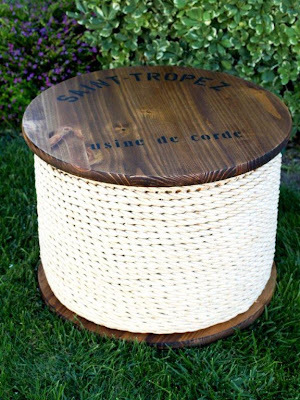 This beautiful Ballard knockoff Table was created by Flamingo Toes. I LOVE LOVE the stencil design she did, I would LOVE to have a table like this in my living room. Did I say "LOVE" enough? 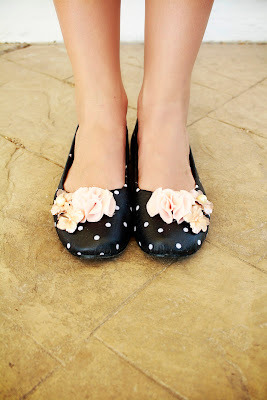 I have seen many shoes makeovers, but this one caught my eye! Posh Pilar successfully put together the polka dot with flowers in different colors and I can't get over how cute this looks. Great job! Thanks again every one, hopefully I can get my act together and post my tutorials soon. Have a great week! Hi Everyone! I am having technical problems and can't post what I have planned to post.I am so sorry! Although, there is something I need to tell you, I am working on a tutorial for making earrings. I shared a couple of the jewelries that I made a few posts ago. After that, I received many comments and emails to share how I did it. I am not a pro at this, and I am pretty sure that you can find some great tutorials in blogland, but I have decided to share my version of how to make them. So come back to see my earring making tutorial next week. I hope everyone has a wonderful weekend! If I need to or want to do something besides all of that, I have to be really organized and creative in order to squeeze something else in to my schedule. One of the things I wanted (and had) to find time to do was to make a "Star of the week poster" for Rachel. I should have planned better, but I didn't so it was done at the last minute, I was running around the house like crazy trying to find stuff to create this. We don't take news paper, but I wanted the "effect", so I copied a few dictionary pages and cut them into triangles. Then, I took shoe polish cream and lightly smeared it on the paper to make them look a little worn out. Now is the time to share your creations with everybody! Wonderlanding made this cute caramel cap. 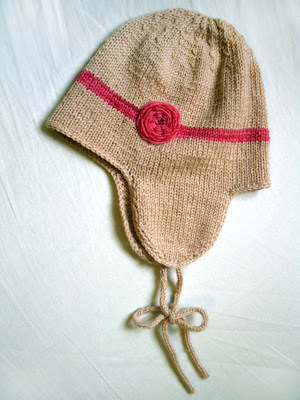 The design of the hat is multi-purpose and I love the pink headband like stipe. Check this out!!! 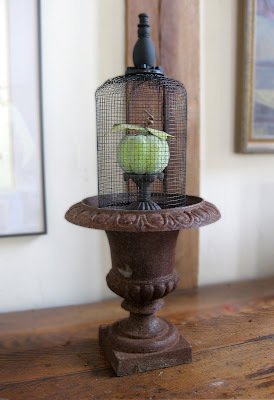 Can't Stop Making Things made this simple, yet amazing decor out of hardware cloth and wire. I so totally want to make this! I love this sweater makeover. The fabric My Closet Thrift Store chose for the trim matches the sweater so nicely. Great Job!! H is for Handmade shares her infinity scarf tutorial. It is a simple project but how she coordinates the scarf with a whole outfit shows off her great sense of style. I WANT THIS... Just Between Friends made this ribbon holder with a small budget. I have tons of ribbons (a couple of years ago I went to American Craft Warehouse sale and got a bunch of them for a great deal.). This will help me to organize the spools nicely. Thank you for sharing your wonderful ideas, talents, and creations! A while ago, Whip up asked me to be a guest blogger for her blog and I accepted the offer gladly! You can find my newest refashion tutorial at Whip Up. Head over and say hi, I hope you enjoy it! I have been given the opportunity to do review for CSN store, go to my sponsor's page and check out what I have decided to review. I am pretty excited about this! Our car was hit from behind. For a second, I didn't know what had just happened, and then I realized that I got rear-ended. I was shaking, but my mind was racing thinking about what I am supposed to do. I looked in the rearview mirror; all my kids were shocked but seemed ok. I called the police, and my husband. I was still shaky...Phew...ok, what's next. At first my reaction to the accident was shock then to scared, after I made sure the kids were ok, the next emotion that came to me was anger. It was a brand new VAN we just bought!!! I was ready to get out the car and talk to the driver who just hit me, oh... I was thinking he is going to get it. I got out of the car, and I saw, a boy walking towards my direction. He seemed anywhere from 16 to 18 years old. He was all apologetic and honest about it. He told me that he stepped on the brake but couldn't stop in time. After that he said sorry several times. Right after his first "I am sorry" my attitude changed. I felt bad for him. He will probably get in trouble for this and his insurance will go up too. (I feel for the parents). Besides, someday my kids will start driving, and things like this might happen. How do I want people to treat my kids? Especially when no one is seriously hurt and the boy is feeling so bad about the whole thing. I believe in Karma. If he was my child I want people to treat him fairly. I swallowed the words that filled my mouth (the ones that he was going to get; don't worry, no swear words were involved. I had my kids in the car too; I don't wanna scar them for life. They would talk about this time after time "the day my mommy lost it"). Eventually, the police came and we took care of the paper work. My husband came, the boy’s parents came. You know what? The boy’s parents were very nice people too. His father came to us and apologized couple times after he saw the damage on our minivan and said "We will make this right; we will take care of this". Wow... how nice is that? People would say, you shouldn't apologize after a car accident, because that is admitting that you are at fault. You might get sued for lots of money. Not them. I felt like the "Sorry" was very sincere, and came from bottom of their hearts. Wouldn't it be wonderful if we are all that way? It was unfortunate that the accident happened, but I felt like I witnessed something rare and beautiful that moment. Our family night was a lot more eventful than I planned. Before I went to bed, I was thinking how blessed we were. Everyone is ok, and we are able to go to bed under the same roof. Ok, everyone, that was the end of the story. Show me what you got for this week’s link party!